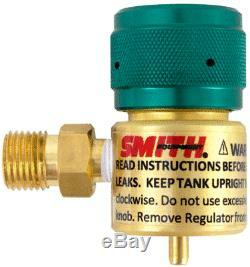 Smith Little Torch with Smith Gas & Oxygen Disposable Regulators and Torch Stand. All images depicted on this listing are for reference. Image may not depict the item exactly. Smith 23-1001D Little Torch Kit 8 FT Hose American Fittings with 5 Tips (#3-7) Tips #3, 4, 5, 6, & 7 will work with Propane/Oxygen, Butane/Oxygen, Natural Gas/Oxygen, Hydrogen/Oxygen, or Acetylene/Oxygen. Super Small Tip #2 only works for Hydrogen/Oxygen or Acetylene/Oxygen. The Smith Little Torch maneuvers easily in areas impossible to reach with larger torches. Produces a perfectly controlled, stable flame hot enough to melt metals, glass and ceramics with thread thin flames up to 6300o F (3482oC). Color coded oxygen and fuel gas lines and valves help prevent errors. 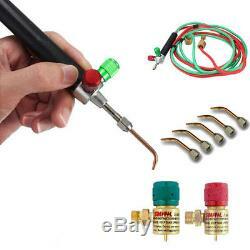 Uses acetylene, propane and propylene based fuels. Welds an unlimited range of materials, brazes and solders the finest elements with ease. 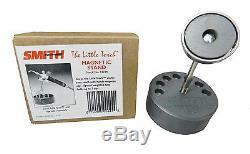 Smith Little Torch Magnetic Holder 14014 Torch Stand Steel Slotted For Tips Torch stand is made by Smith Equipment, a heavy solid metal stand that can be placed on the workbench to hold the Smith Little Torch, metal base comes with pre-drilled holes for storage of up to 7 tips and numbered for tips #2-7. Just a twist of the wrist removes the torch from the magnet. Magnetic clip mounts easily on Little Torch body Smith Little Torch Disposable Cylinders Oxygen 249-499B Smith's regulators for disposable cylinders are designed for attachment to the 14.1 oz and the 16 oz disposable tanks. These are sized to fit the "B" 9/16 hose. 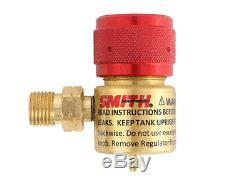 Regulator is compact, preset and screws directly to a disposable propane cylinder. Stock #69.099, 69.081, 69.105 & 69.106. If you have any questions regarding our items. We guarantee and represent that the goods are as described in the above listing. We specifically disclaim any implied warranties of title, merchantability, fitness for a particular purpose and non-infringement. Customers should satisfy themselves that any item choice made is suitable for their intended purpose or use. We pride ourselves on our customer service. Our team is available for all of your questions or concerns. 861 6th Ave Suite 210 San Diego, CA, 92101. We offer quality products at the best price available. Our team is committed to great customer service. Authorized dealer of many prestigious brands. The item "Smith Little Torch with Smith Gas & Oxygen Disposable Regulators and Torch Stand" is in sale since Tuesday, August 04, 2015. This item is in the category "Business & Industrial\Manufacturing & Metalworking\Welding & Soldering\Welding\Gas Regulators, Valves & Accs". 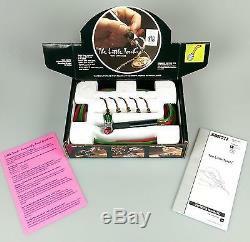 The seller is "paazjewelrysupply" and is located in San Diego, California.